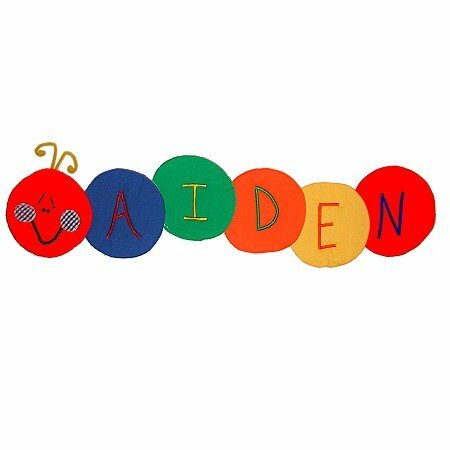 Our Wiggle names wall hangings are soooo cute! Personalized Wiggle names make the perfect baby gift! This is the ORIGINAL Wiggle Worm! Order yours in any of our colors. Wiggles can also be put together vertically, for the door. Please specify color and style on our order form. Price includes 5 letters with each design - additional letters are only $6.00 each. Each letter comes in a variety of pastel and primary colors including solid, check, and dots! Fabric letters are embroidered, filled with foam and backed with cotton fabric. Letters are attached together and hooks are added for hanging on your child's wall or door. Each letter measures approximately 6" in diameter.